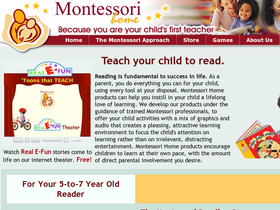 MontessoriHome.com has developed products that can help you instill in your child a lifelong love of learning. Their products were developed under the guidance of trained Montessori professionals, to offer your child activities with a mix of graphics and audio that creates a pleasing, attractive learning environment to focus the child's attention on learning rather than on irrelevant, distracting entertainment. Montessori Home products encourage children to learn at their own pace, with the amount of direct parental involvement you desire. Save on your next purchase from MontessoriHome.com with MontessoriHome.com discounts, MontessoriHome.com promotions and MontessoriHome.com savings from 58coupons.com. MontessoriHome.com helps your child to read with these fun interactive Real-E Fun Stories. Click link to start now. MontessoriHome.com is selling their Level Two Real E-Fun Books at a 60% savings for a limited time only. Click link to view. For a limited time only Montessori Home is offering their Level One Real E-Fun Books at a 60% discount. Click link to shop now. Enjoy savings of 60% on Montessori Level Three Real E-Fun Books at Montessori Home. Hurry, quantities are limited. MontessoriHome.com is offering their Level One, Two & Three Spanish edition Real E-Fun books for 60% off. Quantities are limited. Click link to view.